I loved the 'Crown Jewels' design of nail appliques from Incoco that I wore late last year so much, that I didn't want to take them off too quickly. But I also like to have a fresh look on my nails quite often, at least every 2-3 days. 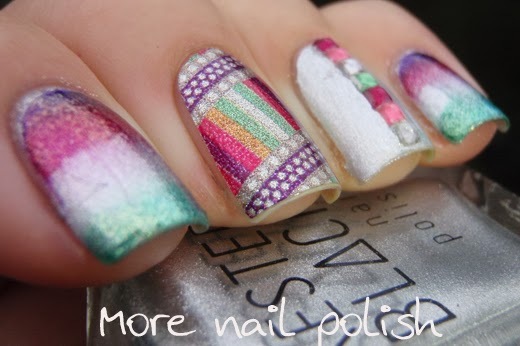 It was on day three when I decided to freshen up this look by creating a skittlette mani. I kept the Incoco nail appliques on my middle finger and thumb, and at the end of day three you can see the slight tip wear. I painted my ring finger silver using Starflower from Kester Black. 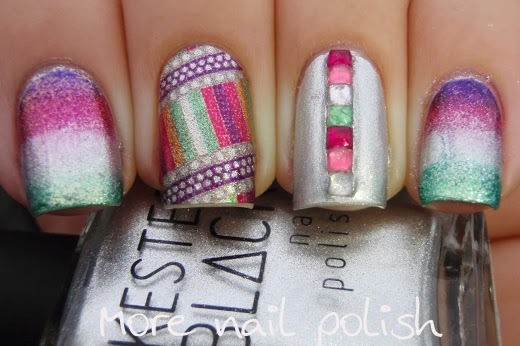 I then placed some square rhinestones down the middle of the nail in matching colours. 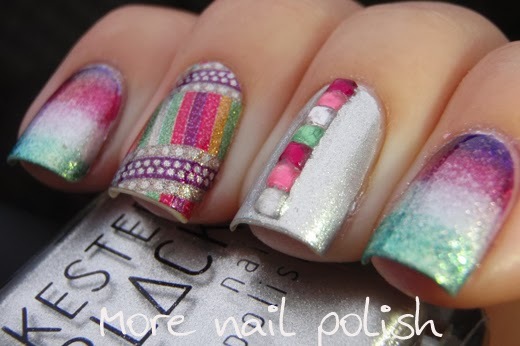 On my index and pinky fingers I created a four colour gradient in the same colours as the nail applique. I'm really struggling to remember each of the colours, but they were all Zoyas. I think they were Mimi, Gilda and Ivanka, together with Kester Black Starflower.. I have to say that sponging with those glass fleck Zoya polishes really makes a mess and it takes ages to clean up! The combination of this makes me swoon! 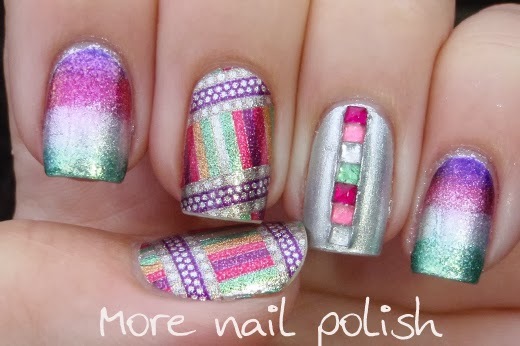 Such a pretty way to mix and match with polish, gems and stickers. Takes a talented eye to match things so well.